Award reflects company's consistently high level of customer service! Hannabery HVAC is proud to announce that it has earned the home service industry's coveted Angie's List Super Service Award for the 5th year in a row. This award honors service professionals who have maintained exceptional service ratings and reviews on Angie's List in 2018. "The service providers that receive our Angie's List Super Service Award have demonstrated the level of excellence that members have come to expect," said Angie's List Founder Angie Hicks. "These pros have provided top-notch service to our members and absolutely deserve recognition for the exemplary customer service they exhibited in the past year." 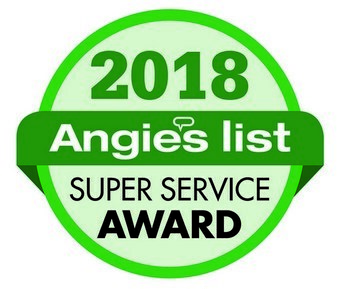 Angie's List Super Service Award 2018 winners have met strict eligibility requirements, which include maintaining an "A" rating in overall grade, recent grade and review period grade. The SSA winners must be in good standing with Angie's List, pass a background check, record a current trade license attestation and abide by Angie's List operational guidelines. Only a fraction of the Heating and Air Conditioning companies in Easter Pennsylvania were able to do it. We use Angie's List to assess whether we're doing a good job keeping valued customers like you happy. Please visit AngiesList.com/Review/122763 in order to grade our quality of work and customer service.